The Sihi ASH pump is a horizontal, self-priming, multi-stage side channel pumps with open vane wheel impellers handling entrained gas during normal duty. Features a specially designed bearing was designed to compensate for the axial forces occurring in case of high nominal pressures. 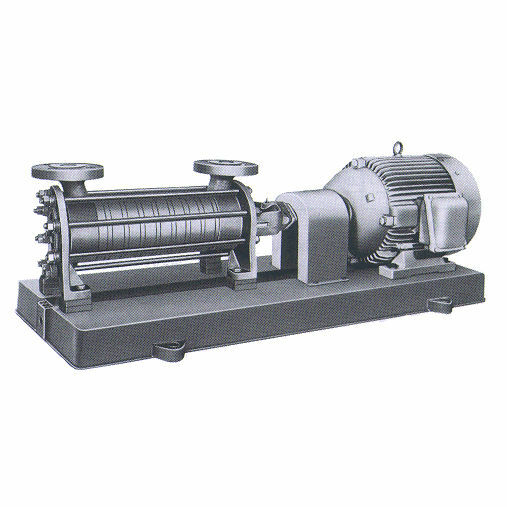 Application- these pumps were developed for handling liquid gases with vapour pressures of up to 80 bar. The high admissible nominal pressure and the optimum operation properties of the material combinations resulted in multiple application of this series, especially suitable for handling carbon dioxide. They are commonly applied in processes and installations for the production, storage and transportation of CO2, in supply plants, measuring, regulation/decanting equipment, fire-extinguishing, inert installations, in CO2 drying and CO2 cleaning plants, for production of dry ice and neutralizing of alkaline waste waters. Technical specifications: flow rate of up to 12 m³/h, head up to 288 m. speed is a maximum of 1800 rpm and the temperature maximum is 120 °C .